Use this map to orient yourself to the SQLShare interface. 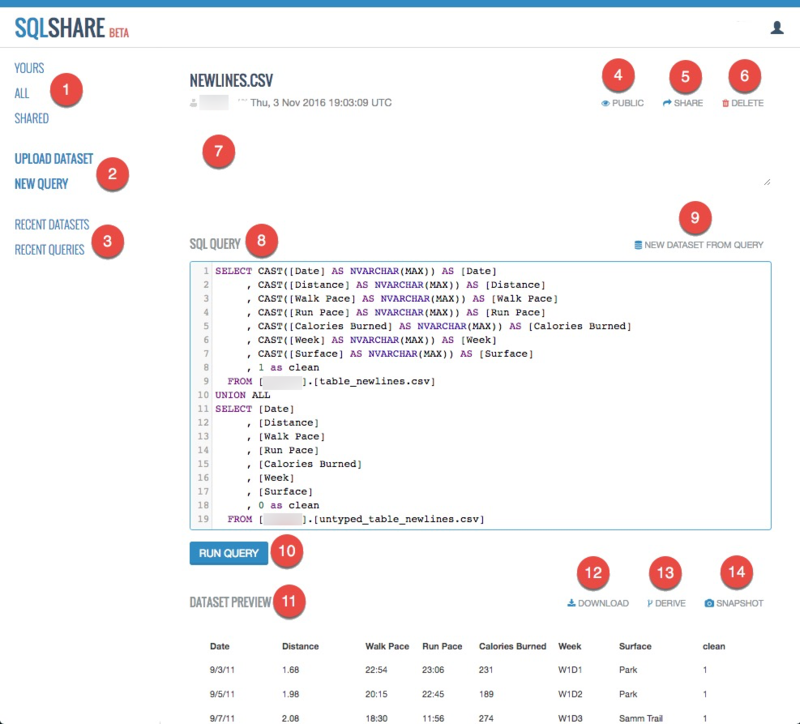 See your uploaded datasets, datasets that have been shared with you, or all public datasets in SQLShare. Upload a dataset or run a new query. View recently uploaded public datasets or recently run queries. Share your dataset with specific people. Enter a simple language description of your dataset. This is particularly helpful when making public or sharing with others. Edit an existing query to create a new query. Create a new dataset by editing the query of an existing dataset. After editing your query, click Run Query to see new results. Derive: Create a new dataset by selecting data in an existing dataset and join two or more datasets together. Snapshot: Runs a query that is pulling data from several places and saves the data. Eliminates the worry that others will change a dataset that you depend upon, and speeds the process of gathering data from multiple sources.